Interested volunteers are always needed and welcome! There is no complicated sign-up process. Just show up! All you need to do is give rescue workers driving by a "thumbs-up", wave, clap, cheer, hold up a "thank you" sign, or wave a flag. You don't even need to bring your own sign - there are plenty available. There is no minimum time committment. Stay for a minute, or as long as you can. Come anytime, day or night, as often as you're able. It's so simple. It's so direct. It's one of the best things you can do! No cash donations are needed or accepted. 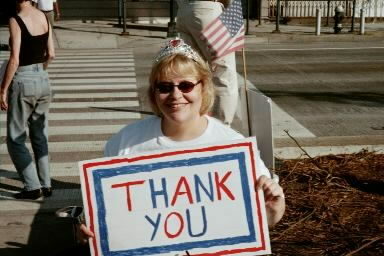 - Bring down a "Thank You" sign for someone else to hold. Signs don't need to be works of art - a simple "Thank You" written on a piece of cardboard is fine. - We can also use hand-held flags to wave at passing rescue workers. - Help from neighborhood businesses is appreciated. Whether it be putting one of our flyers up in your store window, or providing free and/or portable restroom services for some of our volunteers, every little bit helps! - Spread the word about Point Thank You. Volunteers are always needed, especially now, as the weather gets colder. Signs at Point Thank You are available to interested volunteers 24 hours a day, 7 days a week. 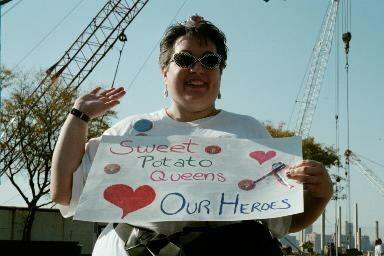 Point Thank You is located at Christopher Street and the West Side Highway (West Street). By Subway: Take the 1 or 2 train to the Christopher Street/Sheridan Square Station, or the E or F trains to West 4th Street. Walk west on Christopher Street to the end, where it meets the West Side Highway (about 6 blocks). By PATH: Take the PATH train to Christopher Street. Walk west on Christopher Street to the end, where it meets the West Side Highway (about 3 blocks).